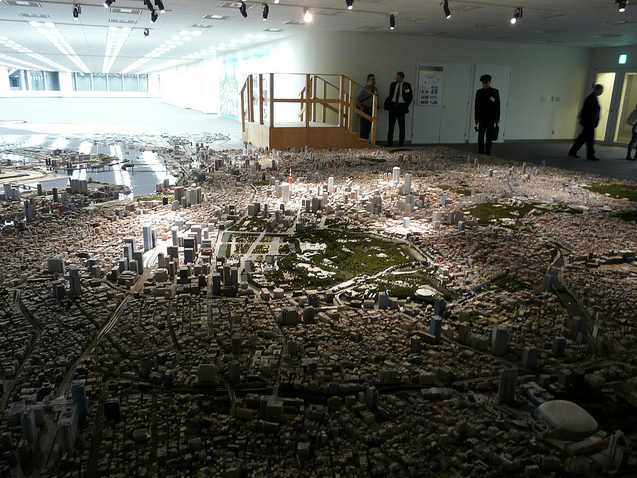 A complex scale model of Tokyo is on view by appointment at Tokyo’s Mori Tower in Roppongi Hills. 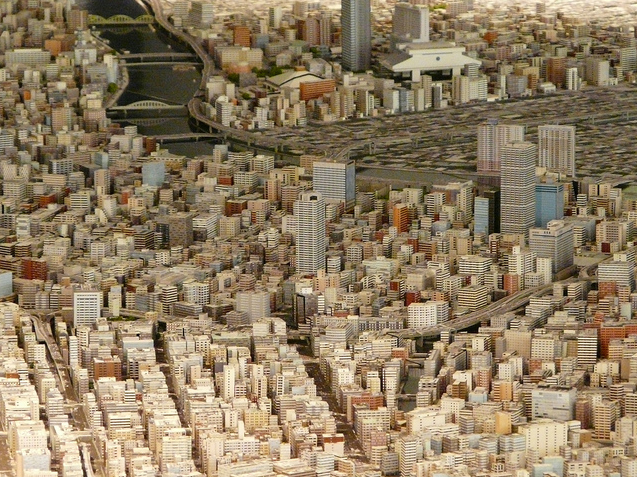 The model was built in 2003 by 30 Mori employees over approximately 17 months. 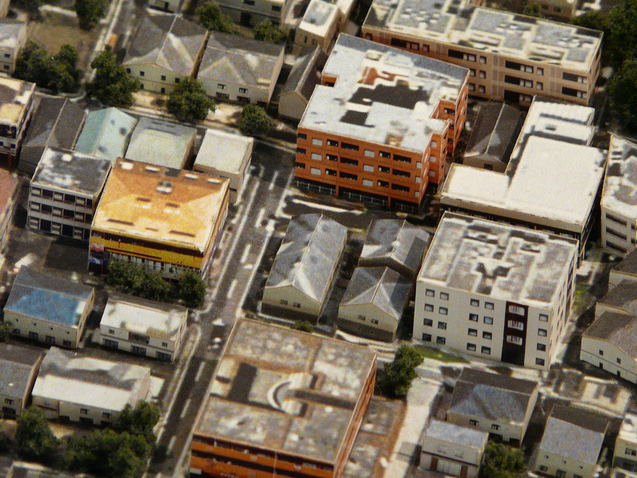 All streets and buildings were photographed at street level and from above via helicopter. They were then adjusted in Photoshop and glued to polystyrene models. 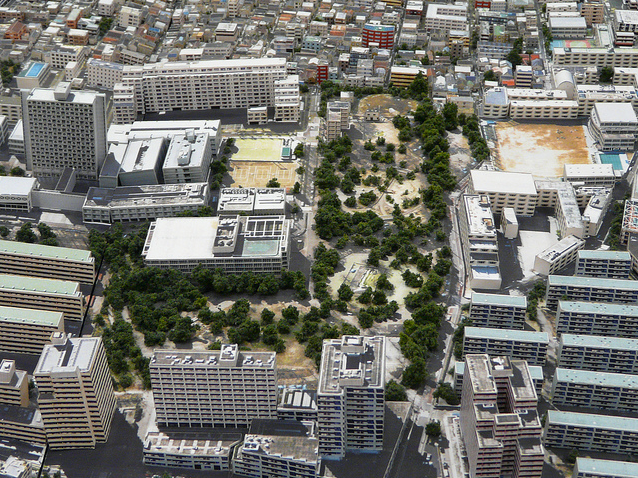 Touring the model is a fascinating introduction to Mori’s vision for the city, which is planned for construction after the company consolidates enough subdivided residential plots. “Just a matter of patience,” the guide assured us. According to the Vertical Garden Cities guide, residents of these all-in-one structures will still be able to explore the city via train lines that pass through basement stations and terminate at spaces of consumption, such as Disneyland and Kidzania (where parents pay to enter and their children “learn about the social system” by pretending to be nurses, dentists, runway models, window cleaners and countless other professions — sponsored by companies like P&G and Coca-Cola). Living space for the employees who service Vertical Garden Cities isn't specified. 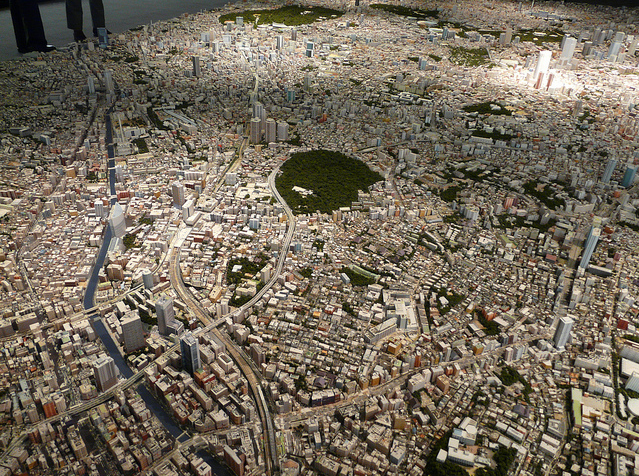 They would probably live in the western half of Tokyo, past Shinjuku, which is of such little interest to Mori that the map ends abruptly at Shinjuku Station. There are no plans to include it in the future. “What is the name of that park at the edge of the map?” I ask. “I don’t know, it’s not important,” answers our guide. Chris Berthelsen is the founder of a-small-lab and Tokyo DIY Gardening. He is originally from New Zealand and currently based in Tokyo. This is part of a collection of featured places from around the world. If you’d like to share photos of a place you find interesting, please add them to the Flickr group or send them to info@thepolisblog.org and we’ll publish your feature. Video and sound recordings are also welcome. Credits: Photos by Chris Berthelsen. incredible! and the additional information on the plans behind this model are very interesting, much appreciated. Hi! 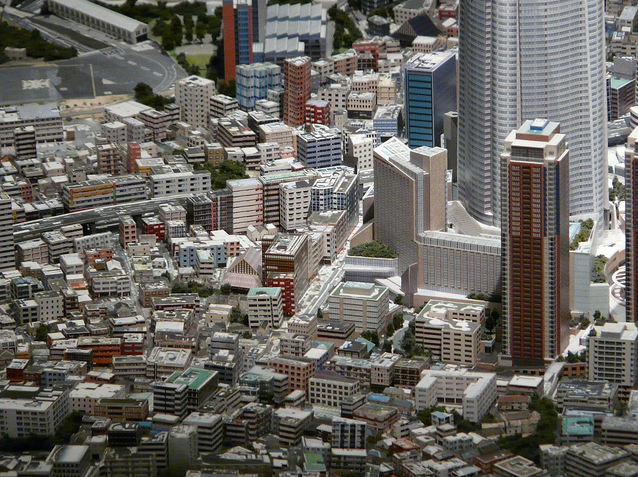 Would you know who I can contact if I want to arrange for a viewing of the scale model?